The Washington Oriental Ceramic Group (WOCG) is a circle of Asian art and culture admirers especially interested in old Asian ceramics. Founded in 1985, the WOCG holds monthly meetings in the Washington, D.C. area focusing on Asian art and culture. 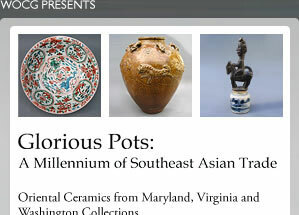 We would like to invite those interested in Asian art and culture in and around the D.C. area to join the group. ©2011 Washington Oriental Ceramic Group. All Rights Reserved.